It may be hard to believe, but spring is creeping into Yellowstone. Baby bison are bouncing around, and shaggy elk are getting more active. But you may wonder how Yellowstone’s animals weather the winter cold. Here’s a list of some of the Park’s most iconic winter residents. With temperatures that usually hover around zero (Fahrenheit) and an average of 150 inches of snow, Yellowstone poses a forbidding winter environment. Many animals head toward warmer climes, or wait out the harsh winter months in the warmth of burrows. Some however, have adapted to survive the Park’s brutal cold. Here are some of the most prominent, and the adaptations they’ve made to face a winter in Yellowstone. Moose fur retains so much heat that the animals will often stay under the shade of trees on sunny winter days. In addition, their long legs allow them to trudge through deep snow with relative ease. Food, however, presents a challenge to moose in winter. Since winter renders their primary food of aquatic plants inaccessible, moose generally survive by browsing on twigs and evergreen needles. These provide far fewer nutrients than grasses and plants so moose limit their movements in winter to conserve energy. Everyone has probably seen pictures of foxes diving into the snow. The positioning of their large ears gives them an acute sense of hearing, allowing them to locate a squeaking mouse 100 yards away or under a deep layer of snow. In addition, when prey is plentiful foxes will cache their kills, saving them for later. 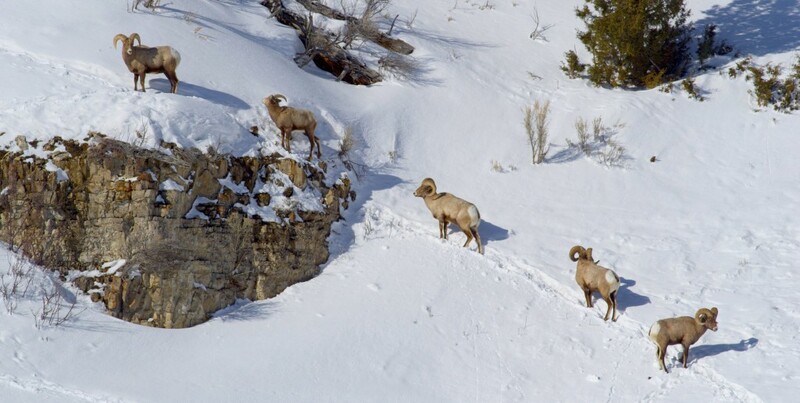 The mountain-dwelling bighorn sheep move into sheltered valleys during the harsh winter months. Their thick coats keep them warm as the search for food. Elk begin to grow their winter coat in early September in response to, not the cold, but the amount of sunshine. Like deciduous trees, an elk’s body reacts to decreasing levels of sunshine by shedding the glossy summer coat and beginning to grow a heavy, two layered winter coat. This winter coat consists of a wooly inner layer under a waterproof layer of guard hairs, and can be as much as five times warmer than a summer coat. Like many other Yellowstone animals, elk migrate to lower elevations and head toward the open water and warmth around geothermal features. Of all animals, beavers are perhaps best suited for winter. They build dams in order to back up streams and create pools deep enough that the bottoms won’t freeze in winter. Beavers don’t live in their dams, instead they build lodges in the middle of these pools, accessible only through underwater entrances. This protects beavers from nearly all predators. As herbivores, beavers eat mostly twigs and branches. In preparation for the long winter months, beavers store piles of twigs in the ponds they have created, the cold water keeps the twigs fresh, allowing the beavers to feast all winter long. Coyotes adapt to winter by eating just about anything. Voracious omnivores, coyotes will often eat a variety of plants when available. During winter, coyotes hunt small mammals and ground nesting birds. Coyotes also often hunt larger mammals, and a pack will sometimes take on adult elk. Coyotes frequently scavenge for food, feasting on winter kill carcasses, and the carcasses left by wolves. Forty two species of birds populate Yellowstone year round, and 7 species migrate to Yellowstone for the winter. Geothermal run-off keeps key waterways open throughout the winter, making the Park an attractive wintering ground for waterfowl that summer in northern Canada. In fact there are probably more swans in Yellowstone during the winter than there are during the summer. During the winter, bison use their wide heads like shovels, batting snow out of the way to get to the grass beneath. Their muscular humps act as counterweights, giving the buffalo even more leverage against deeply packed snow. A bison’s keen nose can detect grass buried under as much as a meter of snow. As highly social animals, bison will stay close to their herd all winter, surviving together.